The Society has again had a busy few months. As I write this report Spring really has arrived and Windsor is deep in preparations for a very special Royal Wedding. Many improvements to roads, pavements and planted areas are taking place and lots of paint is being applied, all of which can only be beneficial to our surroundings. We have offered some ideas about areas that should be on the RBWM improvement list, all to good effect. We have had the unveiling, by The Mayor Cllr John Lenton, of the Blue Plaque commemorating The Princess Christian Hospital/Nursing Home. The Society has been determined to get recognition of the heritage of the building, now known as ‘The Residence’, at the corner of Clarence Road and Trinity Place, and finally, after 3 years, a blue plaque and an information plaque have been installed at the site thanks to the determination of Anne Taylor. The tree work around The Charles Knight Grave area on Bachelors Acre was completed in March and further landscaping is scheduled soon. Since the last Newsletter the last two talks of our season were well worth attending as was our April visit to Highclere. Thanks to Philippa Johnson and Rosemary Wood for organising all the 17/18 season’s events and we look forward to an equally interesting 18/19 programme. As members may be aware, the General Data Protection Regulation (GDPR) comes into force in May 2018 and The Windsor and Eton Society is taking the necessary steps to ensure compliance. Our popular Royal Albert Institute Annual Music Event, which this year features The Queen’s Six, will be on Wednesday 6th June at 7.00pm for 7.30pm in the Drawing Room at Cumberland Lodge, Windsor Great Park. This should be a wonderful evening and is now completely sold out. Seventy members braved the snowy conditions to attend our 72nd Anniversary Dinner. This year we had the privilege of celebrating in Windsor Guildhall which was generally agreed to be a fine venue for the occasion. 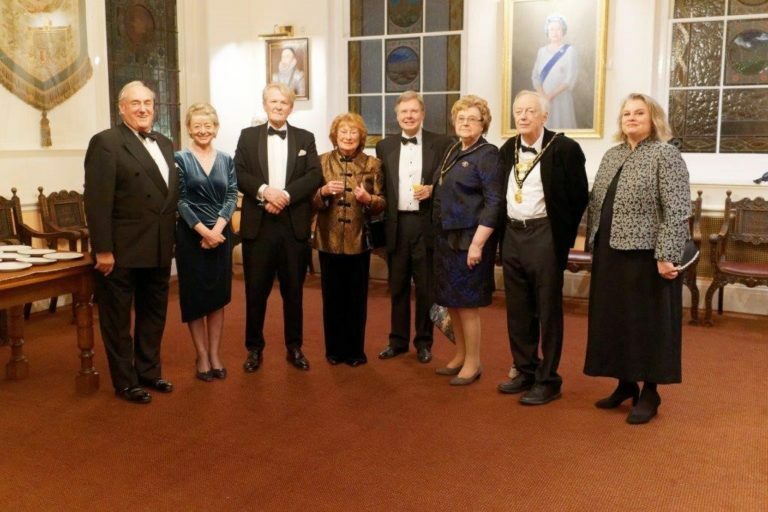 The Mayor and Mayoress of the Royal Borough, Cllr John Lenton and his wife, Margaret, attended which was excellent as it was only through his grant for concessionary use that we were able to meet in the Guildhall. Our guest speaker was Murray Craig who is the Clerk of the Chamberlain’s Court, Guildhall, City of London. His after dinner talk was most entertaining and informative and he clearly thoroughly enjoys his job. Thanks are due to Joan Biggs who is a personal friend of Murray and who thought the Guildhall link would be apposite. 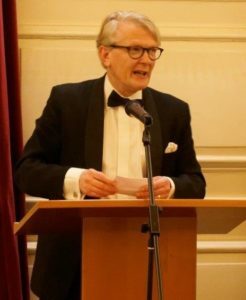 Our President, Sir James Perowne, conducted proceedings with his usual aplomb and the Toasts offered by the Mayor and our Acting Chair, Chris Aitken, were well received. The room was attractively arranged, the food was delicious, the company engaging so everyone enjoyed themselves despite the awful weather outside. On Tuesday 6th March a group of members enjoyed a very interesting and informative visit to the Royal Library in Windsor Castle. After a somewhat delayed start to the visit because our entrance tickets were not waiting for us as planned we were led through the Moat Garden path to the Upper Ward. The governor of the Castle, Admiral Sir James Perowne, our Society’s President, met us at the entrance which gives access to the Royal Library. A selection of books and interesting artefacts had been put on display for us in each of the three rooms which comprise the library and in each room the Castle Bibliographer shared her extensive knowledge of the rooms and their contents with us. We heard how the shelves were hurriedly emptied as the fire of 1992 spread towards the library; fortunately stopping just one room away. We saw the hurried note written on a scrap of paper which the Duke of Marlborough wrote to Queen Anne informing her of her troops’ victory at the battle of Blenheim and in the third room original drawings by Leonardo da Vinci, Raphael and others were on display. A popular exhibit in this room was the exercise book in which the young Princess Elizabeth described her parents’ Coronation in 1937, mentioning how boring it was in parts. There were items of interest to everyone and we will each have our own particular favourites to remember from a most interesting afternoon. There are ten members of the Heritage and Environment Committee which include the Acting Chair of the Society. These ten members include a town planner with expertise on planning rules and regulations, an active member of a Local Residents Group, two former councillors with experience of planning regulations, members with good knowledge of West Windsor as well as those who are very familiar with Central Windsor and members with good awareness of Conservation Areas etc. A member of this group checks the weekly list of Planning Applications (PAs) for RBWM. Any PAs needing further consideration are then forwarded to the group. At our monthly meeting we then discuss these PAs and write letters as necessary. All members take their responsibility seriously and our letters to RBWM are well regarded and given serious consideration. We also have a quarterly meeting with RBWM officers to discuss planning and heritage matters. We are pleased to report that progress continues at the Charles Knight Grave. Three replacement trees have been planted and appear to be thriving. The positioning of the trees had to be altered slightly from the original landscape plan as there is a crypt below the site which did not allow for sufficient depth for the planting. The information plaque has been produced and is now in situ on the plinth to the right hand side of the opening in the railings. This Blue Plaque was unveiled by The Mayor on Tuesday 8th May and a full report on the event will be included in the August newsletter. It has taken a great deal of tenacity and determination by the Society and other interested parties to achieve this permanent recognition of one of Windsor’s buildings of historic interest, and it is hoped that members will make an opportunity to see the plaque and read the information panel. After the snow of the previous week we left Windsor on a rare dry and bright day and had a traffic free journey on the M4, arriving earlier than anticipated at Highclere Castle (oh that all outing journeys were as good as this one!). We were welcomed at Highclere by Barbara who gave us an interesting introductory talk on the Castle and as usual our first port of call was for morning coffee. Highclere, is the home of the Earls of Carnarvon, and there has been a house on the site for many centuries. Major rebuilding works were carried out at Highclere in the late 18th and early 19th centuries when the freestone house was converted to a classical Georgian mansion, and in 1838 the 3rd Earl of Carnarvon commissioned Sir Charles Barry to transform his home into a grand mansion which would impress the world. The Saloon in the heart of the house was designed for the 4th Earl by Thomas Allom in a gothic style with rich decoration and was completed in the 1860’s. Portraits of Carnarvon ancestors hang alongside Dutch paintings from the 17th century and early 19th century art collected during a Grand Tour, whilst in the Music Room 16th century Italian embroideries hang below a baroque ceiling painted by Francis Hayman in the 1730s. In many ways Highclere Castle epitomises the confidence and glamour of the Edwardian period in the first few years of the twentieth century. Visitor books from that period and from between the two World Wars record the house parties full of politicians, technological innovators, Egyptologists, aviators and soldiers. During the First World War, Almina, the 5th Countess of Carnarvon, transformed the Castle into a hospital, and patients began to arrive from Flanders in September 1914. After the war the Castle returned to a private home until it briefly became a home for evacuee children from north London during the Second World War. In 1922 the 5th Earl, together with Howard Carter, discovered the tomb of Tutankhamun and the Castle now boasts an Egyptian Museum where information and displays about Egyptian history and culture sit alongside actual and replica artefacts from the tomb. Highclere Castle has become well known as the set for the home of the Earl of Grantham in Downton Abbey, and in each of the rooms that were used photos from the series are displayed to enable visitors to compare them with the context in which they were set. Our day at Highclere was on a free flow basis, allowing us to visit the various attractions as we wished, and due to the Castle and grounds being closed that day to all but booked tours we had the benefit of it being relatively quiet. All 41 members who took part in the visit had an enjoyable and interesting day, enhanced by the sunshine. Set in the beautiful Wiltshire countryside and home to the Earls of Pembroke since the 1540s, Wilton House is first and foremost a family home and has been for over 450 years. Since 1544 when the buildings and land were granted by Henry VIII to Sir William Herbert, Wilton House has been inextricably linked to the political and artistic circles of England. The magnificent state rooms at Wilton designed by Inigo Jones include The Single Cube Room and The Double Cube Room the great room of the house. The House also has a world famous art collection by renowned artists such as van Dyck, Pieter Brueghel and Rembrandt. With over 22 acres of parkland and gardens, bordered by the rivers Wylye and Nadder, the Grounds are perfect for visitors to explore. Booking for this visit is now closed. Our talk in April was given by David Bullock, a local PCSO. As a boy he had become fascinated by the mystery of Jack the Ripper and for the last 27yrs has read everything available on this subject. Owing to his job as a policeman he has been able to apply his knowledge to looking deeper into this mystery and noticed several points that had been previously overlooked. One of the victims even came from Windsor. To find out more you’ll have to read David’s book: “The Man who would be Jack: the hunt for the Real Ripper”. Our next season of Talks begins on Wednesday 12th September at 8pm in Upton House School when Mark Piper will tell us about the history of the Theatre Royal, Windsor. The talks this year have been well attended and we look forward to welcoming members again during the 2018/19 season. Allan moved from his home in Glasgow and studied Advertising Photography from 1973-1976 in London. Following his graduation he worked in the advertising industry as an assistant photographer and photographer. Allan was later offered the opportunity to produce television commercials from a base in Bray Studios and moved there in 1979 where he produced commercials and special effects sequences. He was also Assistant Studio Manager. A further move in the early ‘80s took him to Pinewood Studios where he worked with Gerry Anderson as his assistant producer. By the mid ‘80s the demise and uncertainty of the Film Industry forced a career change and Allan then began a 25 year career in the City of London running a busy and successful Financial Consultancy under the umbrella of Zurich UK. He sold his Practice a number of years ago and now looks after my modest portfolio of London rental properties. Allan joined the Committee at the last AGM and since then has been representing the Society on the Charles Knight Grave project. Windsor’s Branch of WEA will be launching their new brochure of Adult Education Classes 2018-19 at this event when there will be the opportunity to learn about and enrol on the courses. The Summer Event is a social gathering with a guest speaker and refreshments and all are welcome attend. Behind the Headlines:News as Fact or Fiction? American Art, and World Heritage Architecture. Edward Burne-Jones and the Pre-Raphaelites, which will complement a major exhibition at Tate Britain in the Autumn – October 2018 – lecturer Sandra Smith, St George’s School, Windsor. An Introduction to Opera, which will use many audio and video excerpts to explore the different styles of opera that have prevailed over the last four centuries – February – lecturer Robin John, Upton House School, Windsor.